Ian Swindells of England built this lowracer from scrap and custom parts. 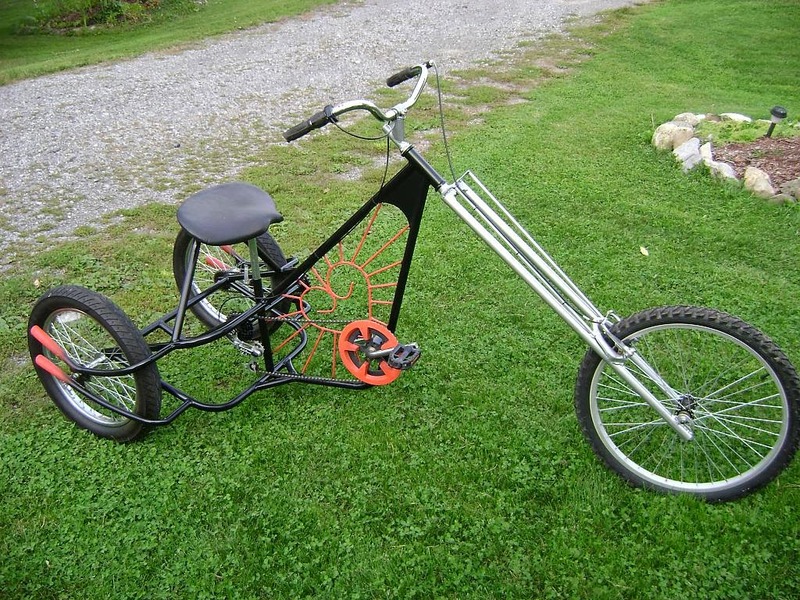 Ian W. Swindells (forum member swizz69) always wanted a recumbent bicycle. 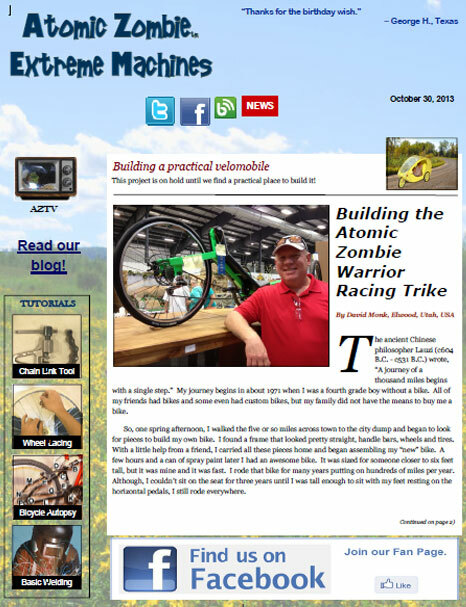 Researching online brought him to the AtomicZombie builders forum. 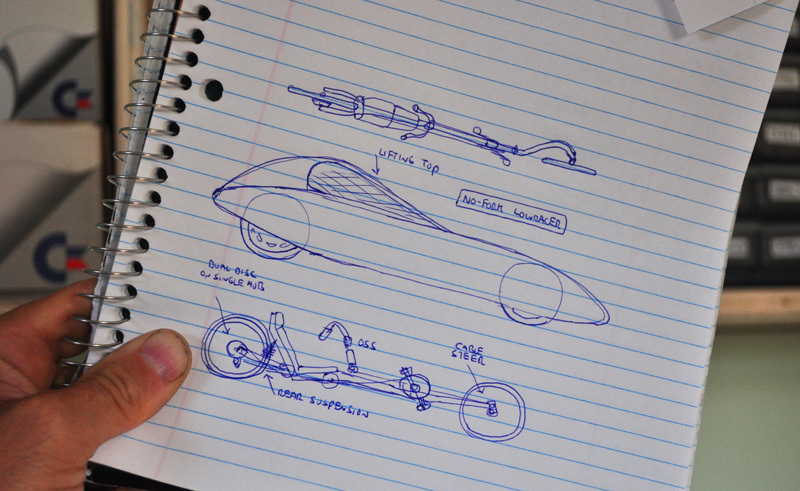 After learning about the Warrior Tadpole Trike, Swindells was motivated to design and build a Front Wheel Drive recumbent lowracer. In a feature article for the AZ newsletter, Swindells discusses the project and the challenges along the way. 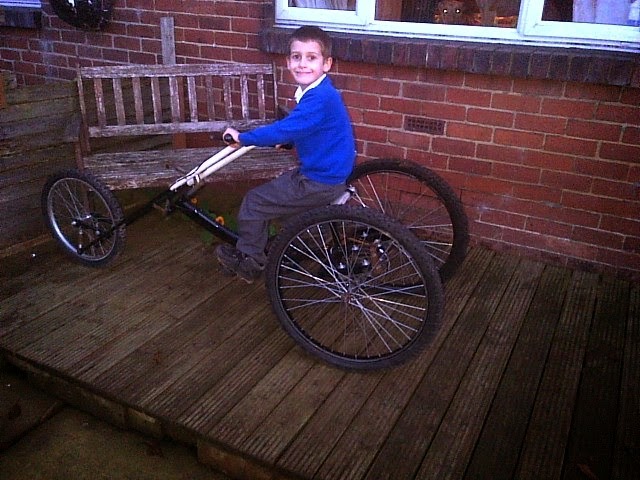 Tay helped his dad build this chopper trike from scrap bike parts. 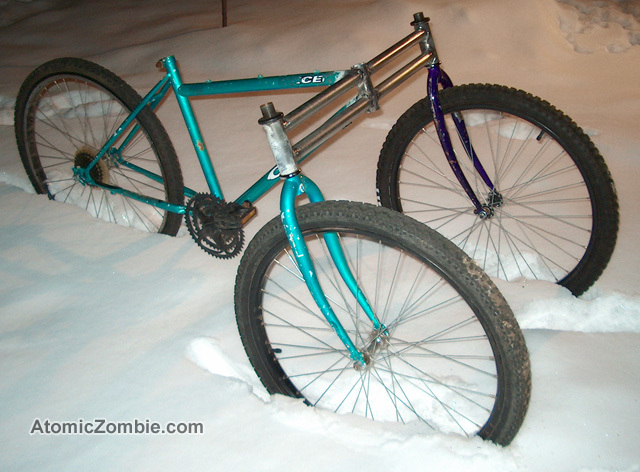 Submitted by AtomicZombie forum member and bike builder, Naughtyboy. “We built this because my youngest two kids needed bigger bikes and they both love workshop time with daddy. We’ve built all sorts from scrap wood and metal and they have even helped me with rebuilding an old Land rover. Tay decided he wanted a trike after seeing my Gladiator (chopper trike) plans, and he also looked through my 15 other plans to plan future bikes. 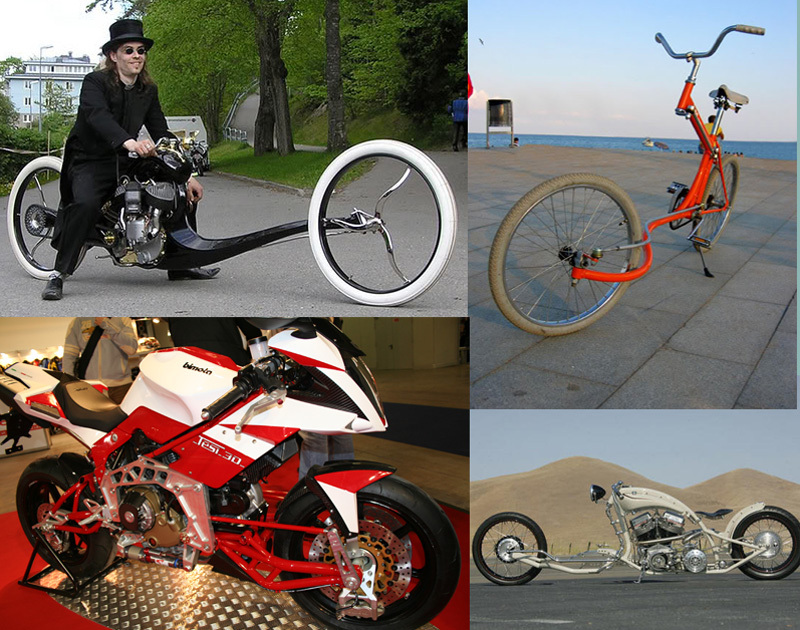 The front is based on the Gladiator chopper trike and the rear, I think, was based on the DeltaRunner Recumbent Trike, but flipped over. The forks are made from 16mm od x 8mm id blow pin shafts left over from machine re-furb at work. Suspension is made of old trampoline springs I found. 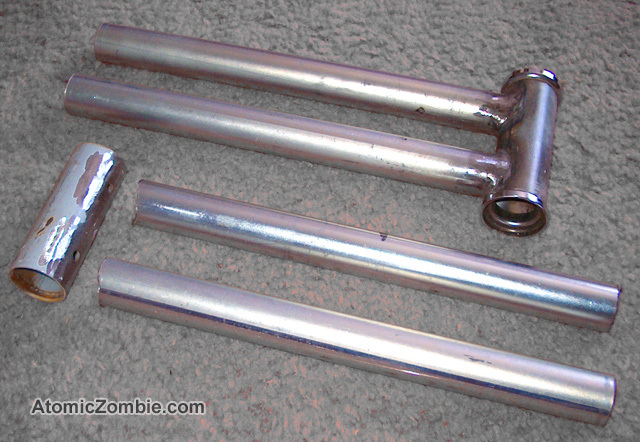 The handlebars are from an old rotavator which I’m planning on using engine on quad-cycle (so many ideas, so little time). I had to turn some sleeves to fit them as id was bigger than od of forks. Tay helped with drilling on lathe. Front wheel is 20″ and back started as the same size, but are now 26″ as we needed the smaller one for his little sister’s trike. 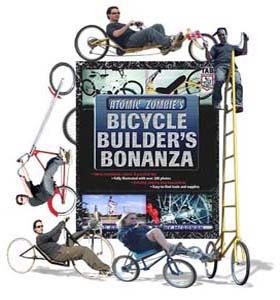 Bike builders community: Hot topics and intriguing conversations. 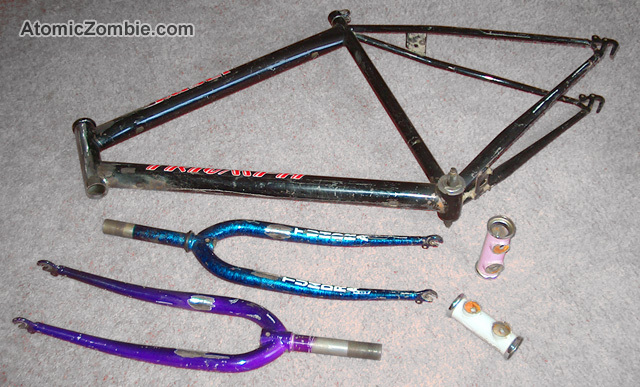 Bike builders gallery: New additions. Upload your own photos. 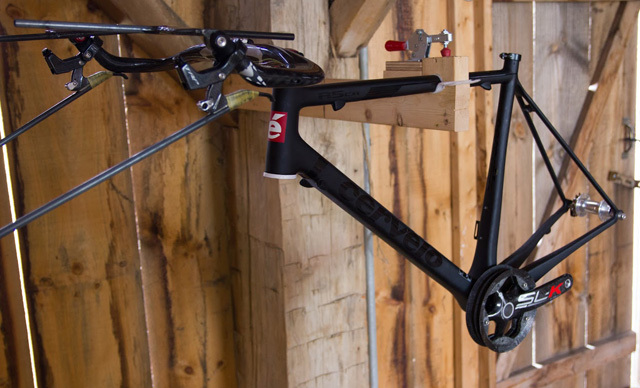 Bike builders feedback: We love to hear from you. Now that you have a plan and a desire to conquer winter, let’s start by gathering some parts. 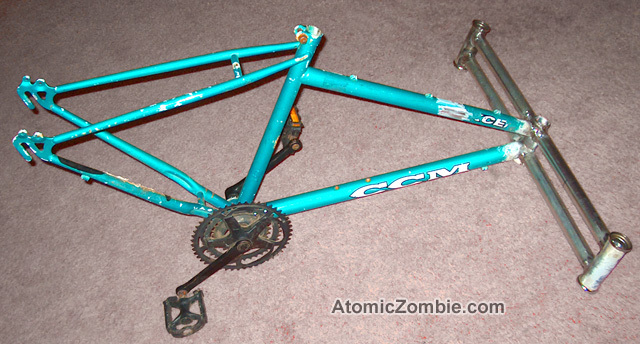 As shown in Figure 1, you will need a complete mountain bike (stripped down to the frame), two front wheels, two head tubes (ground clean) and a matching pair of front forks. 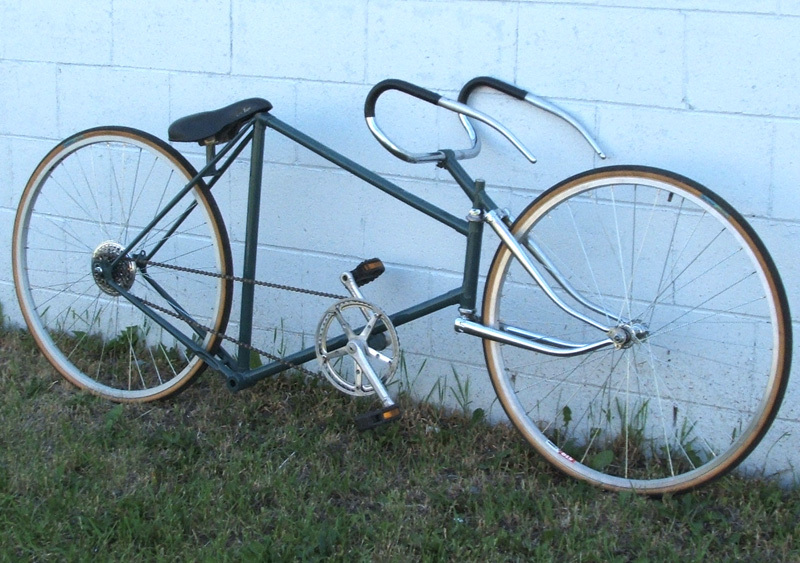 The critical requirement here is that both head tubes, forks, and front wheels be identical or very close in size. Even the tires should be the same, as any mismatch will cause the final bike to be uneven and wobbly. It was great to hear that the Sikorsky challenge has finally been conquered. This challenge was put forward by the Sikorsky Aircraft Corporation way back in 1980 offering half a million smackers to anyone who could create a human only powered craft that would hover stationary in a space of no more than 30 feet x 30 feet for a minimum of 60 seconds at an altitude of at least 10 feet. Anyone who knows something about air flight will tell you that this a huge challenge, pushing the absolute boundaries of what is considered possible. 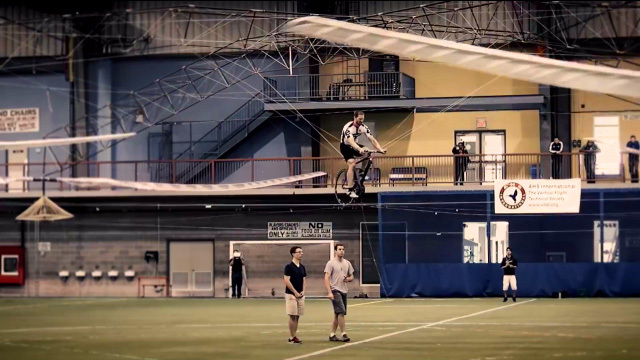 But, in July a Canadian team (Aerovelo) at the University of Toronto comprised of students, staff, volunteers and professionals claimed the prize with their human powered copter called “Atlas”. Can you imagine what it takes to spin up a four 33 foot blades and lift yourself plus the 120 pound machine into the air, at the same time controlling the flight in three dimensions? WOW is all I can say! When you see the entire copter sitting there on the ground, you can really appreciate the engineering that went into making such a huge machine only weighing 120 pounds. The framework is made of composite rods and wire, so it is lightweight and just strong enough for the task at hand. The team went through many design changes over a year as they worked out the limits of the framework, snapping tubes and breaking many support wires along the way. 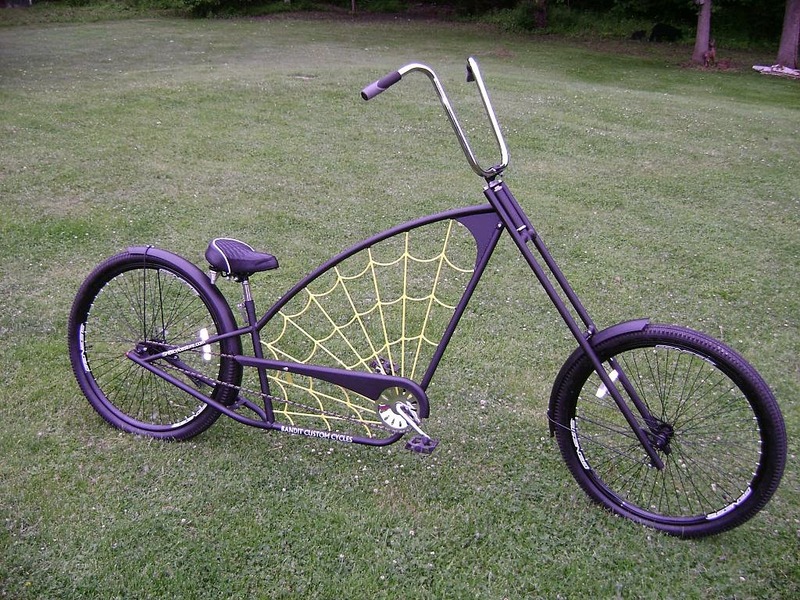 Everything about this craft is cool! Here is a shot of the transmission system which includes a high RPM fixed gear rear wheel that acts as a dampening system to smooth out the pilot’s pedaling efforts. 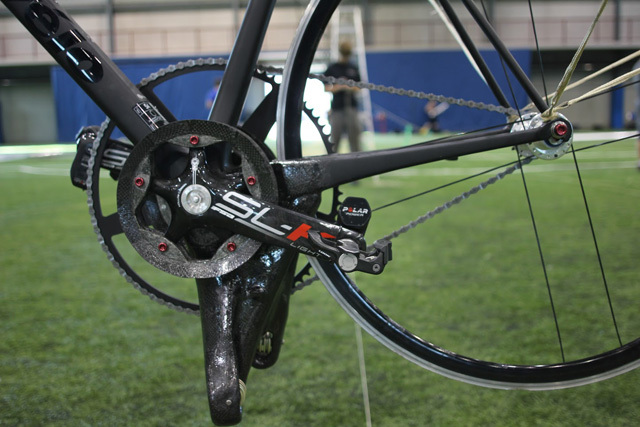 This makes sense because there is little power at top dead center during a crank revolution that would lead to slowing of the rotors and would probably cause huge oscillations in the frame and massive power loss. This flywheel keeps the power output constant without really storing any energy and that would break the rules of the contest. On the left side of the crank, there is a set of pulleys and guide idlers that transfer power via cable to the rotors. Cable drive is necessary because a chain of that length would weigh too much. Check out the huge chainring; there must be 80 teeth on the beast! 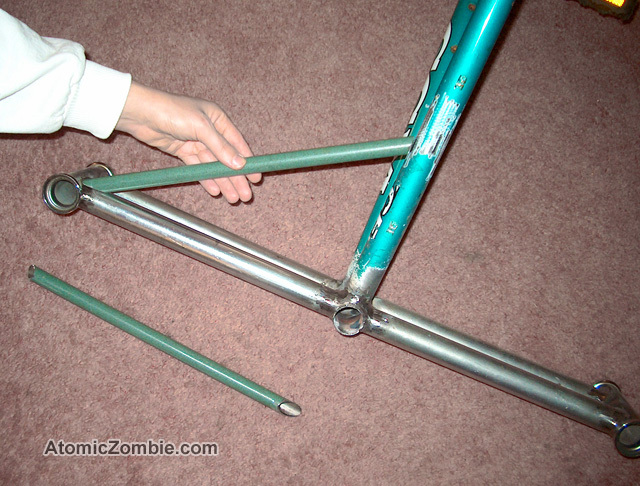 The pilot sits atop a carbon fibre road bike frame that is suspended in the main frame by wires. Craft control is accomplished by rods attached to what used to be the brake levers. I have not seen much detail on the control system, but would I imagine that it works by simply flexing the frame so that the pilot can change the angle of the rotors slightly to fine tune position while in flight. According to the rules, they have to stay within a 30 foot by 30 foot space for one minute. Every part of the craft is made using the lightest possible materials. This required some seriously detailed work from the team. The picture above is one of the four rotors, a huge spoked wheel made of composite materials and wire for spokes. 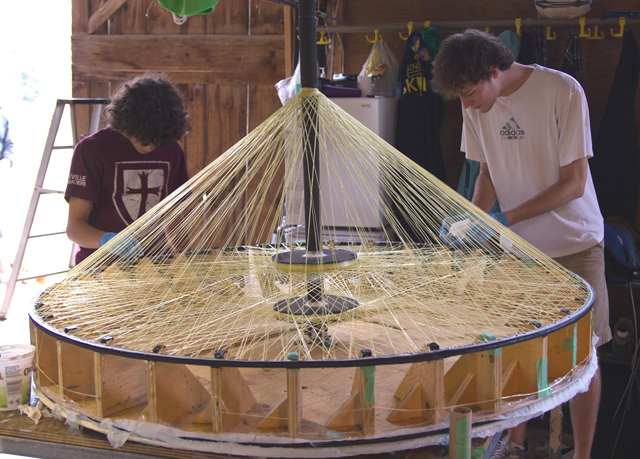 If you think that lacing a 36 hole bicycle rim is a chore, just imagine making this wheel!